Womens Hairstyles from the 1940's and how to achieve them. This book is one of 3 in a series by Daniela Turudich, all of which should be in your book collection if you have an interest in wearing 1940's fashion. The other two are Vintage Wedding and Vintage Face, both of which are reviewed elsewhere on this site. 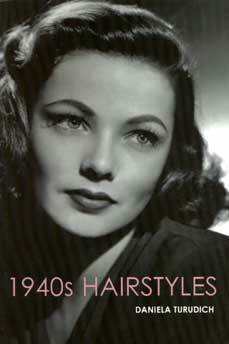 1940s Hairstyles is a regular girls guide to producing 1940s Hairstyles. It is full of useful tips for not only producing the right style but also for deciding on which style is right for you. It covers a whole variety of styles for differing lengths of hair and is illustrated throughout with original photographs, diagrams and even original advertising material. The book has 111 pages and although written in America is well worth purchasing. So many people have asked me in the past 'How do I do my hair in a 40's style?" that this book is sure to be a big hit. Well worth buying! !